News, information and expertise from the manufacturing applications touched by quality control and assurance. The latest products to help you improve your manufacturing process. A showcase of the latest products and services from quality vendors. Web-only articles covering quality assurance and process improvement. Web-only articles covering non-destructive testing and materials testing. Web-only articles covering the vision and sensors market. Information on the latest quality technology, equipment, products and services. 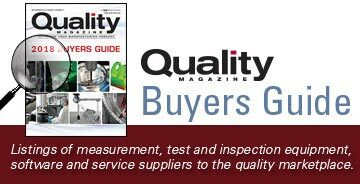 Quality’s collection of the industry’s most informative technical, business and process-oriented white papers. Information and free trials of the latest Quality products and services. InfoCenter sponsored by Carl Zeiss IMT. Learn more about comprehensive metrology solutions. InfoCenter sponsored by Intelex. Learn more about quality management, risk basked thinking, and compliance and regulations. InfoCenter sponsored by Shimadzu. Learn more about materials testing & analysis. InfoCenter sponsored by InfinityQS. Learn more about modern manufacturing quality control with SPC.